Spring is here, and recreational prices are dropping. I picked up 4 grams of Critical Jack for $54.75 (with tax) at Ocean Greens, a quaint little shop you should definitely check out (if not just for the deals). The budtender that helped me, Tony, was eager to work out the best choice for the best price, and I thank him for his exemplary service to mankind. 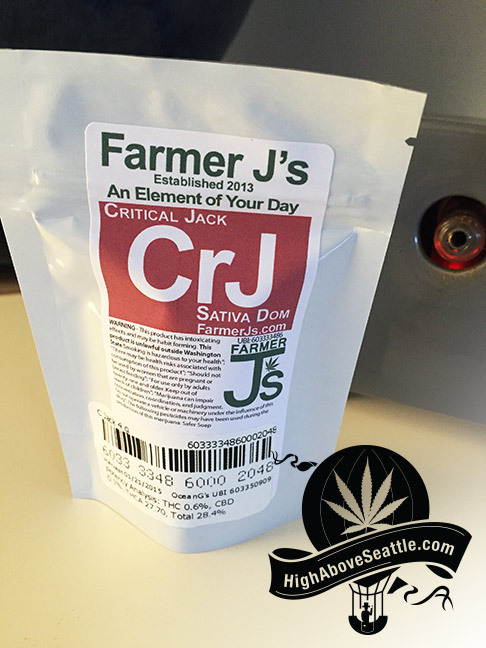 Critical Jack is cultivated by Farmer J’s, a local producer who we’ve sampled before. There is nothing like a good sativa – but a good sativa at a bargain is literally what I’ve been looking forward to with this whole recreational initiative. A Spokane valley based producer, Farmer J’s has a focus on on delivering high quality products with an even higher standard – a little thing they refer to as “the green standard”. This is a determined producer, to quote from their website: Farmer J’s will come to be known as the benchmark supplier to retailers. We are “the Green Standard”. A strong prediction indeed, but these guys have potent products and solid pricing… I wouldn’t be surprised if they become popular, and synonymous with quality Washington marijuana. The packaging is smartly done; displaying the periodic table of elements classification (hilariously created for each strain Farmer J’s produce) and branding on the front. I quite enjoy the Heisenberg-esque aesthetic this labeling conjures, and also within the potency of the product itself. 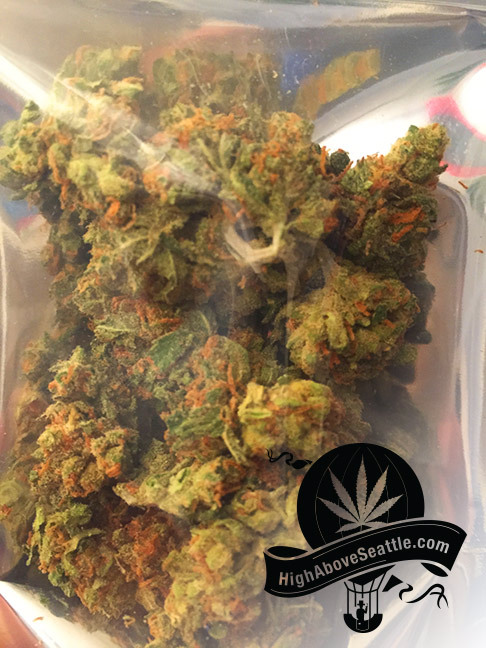 Turning the bag over, the back of the sack is completely see through – which is important for WA recreational marijuana packaging (it is illegal to open the package in public i.e. anywhere but home). I like to see my nugs before I buy them, and you are like minded then just abide by my creed: If the bag is opaque, a mistake you might make. 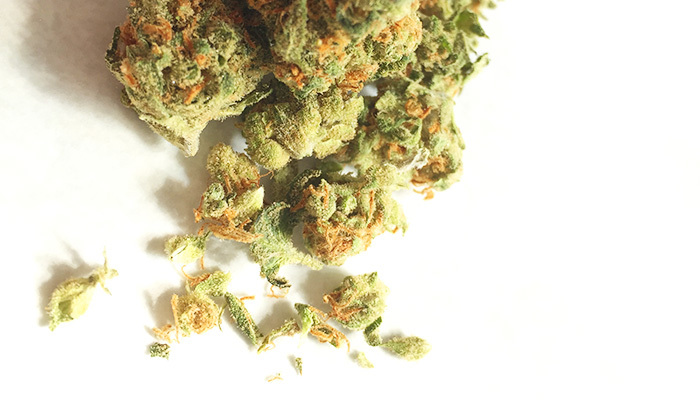 Critical Jack has a crispy cure, crumbling nicely in a grinder and in-between your fingertips. The color is a reddish hue, putting a scarlet filter on the green nugs. It’s not too sticky, and it burns rather nice. The smell of Critical Jack is chronically potent – a mixture of berry-fruit and stinky cheese. Prepare for your room to be permeated with a delicious hallowed funk. Breath in heavy. When sampling the strain, this author tasted hints of grape, along with earthiness. The flavor lingers for several moments, and dissipates much like the smoke itself. Partaking in both a water pipe and a vaporizer, both yielded a similar taste, but the water pipe was more preferable (as the nugs burn quite smooth for this strain). Getting high with Critical Jack is an experience I’d liken to drinking a fine glass of red wine. The feeling is fast, yet detailed – allowing one to be creative, efficient, and stoned off your gourd. Are you looking for Spring strains? Critical Jack is certainly worth adding to your list, delivering a tasty and punchy experience. Do some gardening, walk that dog, strum a stringed instrument, press some buttons, whatever you do; answer the beckoning call of activity with a bud that will uplift and enhance. Thanks Farmer J’s, for a lovely smoke – looking forward to our next meeting.